There are hundreds of embroidered samplers in the Textiles Department – they are a collection strength spanning several centuries and many countries. My favorite samplers are those from Mexico for they often show the convergence of European and indigenous cultures in their motifs and designs. While there are a number of beautiful samplers from Mexico, only one has an intriguing figure known as the Obsidian Serpent. 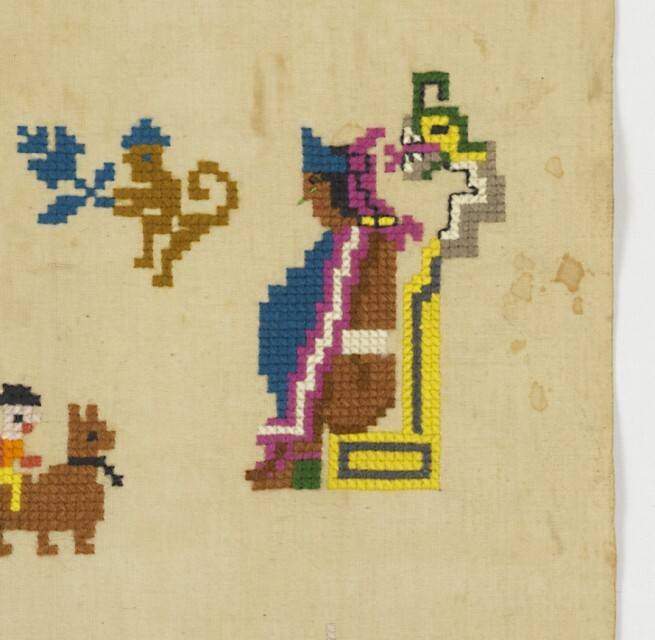 Embroidered in 1870 by Micaela Garsia, her sampler shows in the upper right hand corner the figure of Itzcoatl, the fourth Mexica ruler, who led the Aztecs from 1427–1440. Known as the Obsidian Serpent of Knives, he is seated on a basket-work throne wearing a blue cape or xiuhtilmatli. He is identified by his name glyph – an obsidian serpent that rises from behind his head. The Aztec ruler succession was illustrated in a similar fashion in many of the codices – books created by the Aztecs in the pre-Columbian and early colonial period that pictorially describe Aztec life and history. Detail of Itzcoatl from sampler 1981-28-376. After gaining independence from Spain in 1821, Mexico sought to define itself in a period that saw not only the struggle between liberal reformers and conservatives, but a French invasion as well. In the chaotic decades that followed independence, many writers, artists and intellectuals looked to the Aztec past as a source of national pride. Celebrating the period before the Spanish conquest allowed Mexico to shape its national history and to create public symbols that could unify the country. I suspect that the inclusion of Itzcoatl in Micaela’s sampler is directly related to the desire to create a new national narrative that included noble and heroic figures from the ancient past. The act of promoting and teaching pre-Columbian history allowed Mexicans of this period to begin to shape a vision of their country as a modern nation free from Spanish imperial influence. Sampler, 1870, Bequest of Gertrude M. Oppenheimer, 1981-28-376.